A car is made from a lot of metal parts which are very often joined together by welding. To examine the quality of these joints, ultrasonic techniques can replace traditional tear-down tests and can give more and immediate information for control of the manufacturing process. 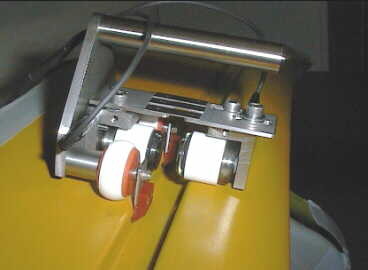 Special ultrasonic techniques are shown for the different joints in car production, and their implementation into the quality management system is demonstrated. Keywords: Car manufacturing, spot welds, laser-beam welds, gas-shielded welds, quality management. Besides the car body there are many other welded components in a car where the joints can be ultrasonically inspected, refer to Table 1. But this report only covers welds in the car body, e.g. resistance spot welds, laser beam welds, gas-shielded welds, and welds on bolts. Table 1: Welded joints in car components. 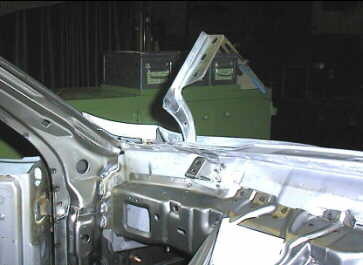 A car body may contain more than 3000 welds from floor to roof, on motor compartment, seat rails and doors. All these welds are numbered in construction plans and the results of the ultrasonic examinations have to be linked to these individual positions and numbers. This produces a basis for quality assurance for all joints in the components of the car body. 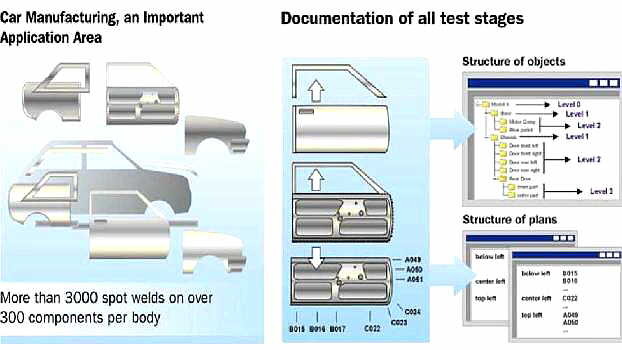 Figure 1 shows some components of a car body, and as an example the numbering of spot welds of a special front door. The construction and design department gives detailed information on the locationof the welds and on the welding techniques in production plans. This is combined with testing specifications and knowledge-based evaluation programs for special ultrasonic testing stations situated close to welding stations (robots). The examination results are transferred to quality management where they are stored and evaluated and from where control commands go to the production site. This shows that ultrasonic testing is only a link in a quality control process chain. Fig 1: Quality management in car body manufacturing. 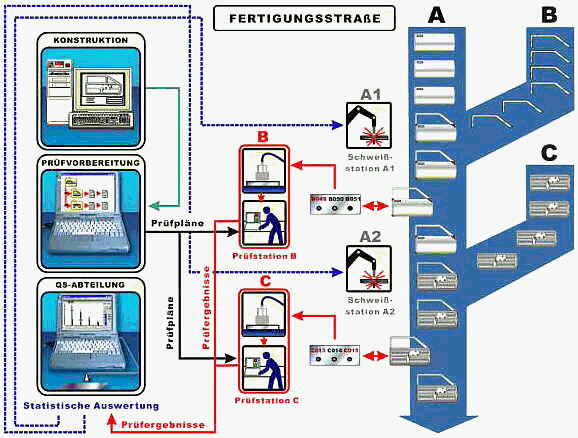 Fig 2: Data flow between production line, NDT-station and quality management. During the production flow spot welds on special car components, e.g. a left front door, are manually inspected following an inspection plan for this component as shown on the computer. A special spot weld probe is coupled to the spot by a flexible membrane, see figure 3. The multiple echo series from the spot is evaluated. The instrument identifies the connected probe automatically, so there is a check to see that the correct probe is used for the actual weld spots. A special evaluation tool, AEA - Automated Evaluation Assistance, gives proposals to the operator in order to help him to decide on the quality of the spot welds, resulting in a green light which means <correct> or a red signal which means <not correct>. 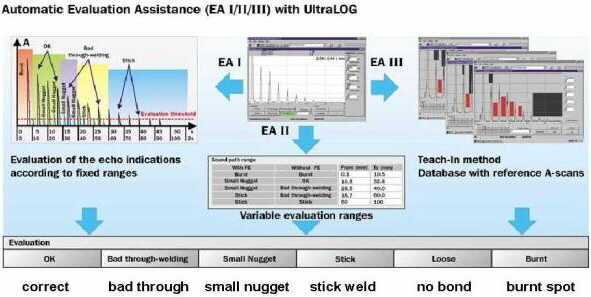 This AEA program is part of the UltraLog program for management of spot weld inspection results in car production. It uses the information given by amplitude and time-of-flight in different parts of the multiple echo series in relation to known parameters of the plates to be joined, see fig. 4. Fig 3: Spot weld inspection using dialogue probe and automated evaluation assistance. Fig 4: Sorting spot weld inspection results with the aid of AEA program. Fig 5: Typical screen displays with spot weld examination . Bad joints can be sorted into 5 classes to give information for control of the welding process parameters. Figure 5 shows the echo pattern of a correct spot and the screen patterns for <bad through welding> and <small nugget> in more detail. In both bad cases there is not enough molten metal to give a strong joint, but the reasons for these defective welds are different. Some components of a car are joined by nut and bolt. The bolts themselves are welded to the steel plate by electric arc welding, see figure 6. Fig 6: Bolts welded to a steel plate. Fig 7: Through-transmission technique for bolt welds. To examine the bolt welds a special through-transmission technique was developped using focused angle beam probes with its focal point at the weld. This is shown in figure 7. Good nuggets attenuate and give a weak through-transmission signal. 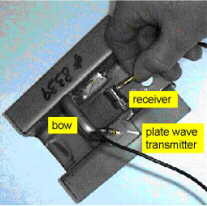 With bad welds the sound waves propagate through the plate and the through-transmission signal is high. Figure 8 shows a part of the laser beam weld from the roof area in a car body. 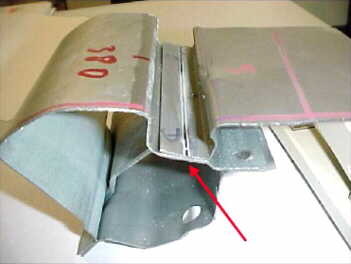 Because of the profiled shape of the plates there is no direct access to the area close to the weld. Fig 8: Laser beam weld on a car body. Fig 9: Through transmission technique for laser beam welds. Therefore a through-transmission technique is used according to figure 9, where guided waves have to pass the weld area. A strong signal indicates a good weld, a missing signal shows a defective weld area. Because fluid coupling is not allowed, a special roller probe for dry contact was designed which is guided by profiled plates, see figure 10. Fig 10: Roller probes for laser beam welds. To join some movable components to the car body, e.g. doors, seats, fixing plates (hinges) have to be welded to the steel plate. Figure 11 shows such weldings at the A-column/front door/front panel area. 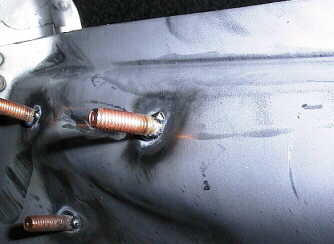 Fig 11: Gas-shielded welds on a car body. Fig 12: Special through-transmission technique for gas-shielded welds. Production plans have to be combined with inspection plans. Special programs give support to the operator to achieve a quick and correct decision on weld quality. There is a file with teached-in A-scans available for typical weld defects. Manufacturing data from the production lines have to be automatically linked to the inspection results, and all these data have to be evaluated nearly online to achieve an active control of the production process. Fig 13: Certificate of a spot weld probe. In quality management it is a must to confirm the examination equipment periodically. Because with spot-weld probes for evaluation the beam width is compared to the actual size of the weld nugget, the beam diameter must be periodically measured and certified. Figure 13 shows such a probe certificate for a spot weld probe for 4-mm-nuggets. The sound beam is symmetrical and the beam shape is circular. The beam diameter at -18 dB drop measures 4.1 mm, i.e. it is within the acceptable tolerance. Krautkramer supports standardization of this ultrasonic weld technique in the respective committee of the German Welding Society (DVS). Additionally there is a steering committee consisting of people from the automotive industry and from the manufacturers of equipment with the purpose of exchanging ideas and experiences on ultrasonic weld testing within car manufacturing. Krautkramer offers special training courses for spot weld testing and supports activities of the German Welding Society (DVS) and of the American Society for Nondestructive Testing (ASNT) on certification of personnel for weld testing in the automotive industry.